3-Arthur William Walker was born on 18 Nov 1872 in Westbury, Tasmania and died on 11 Jun 1961 at age 88. 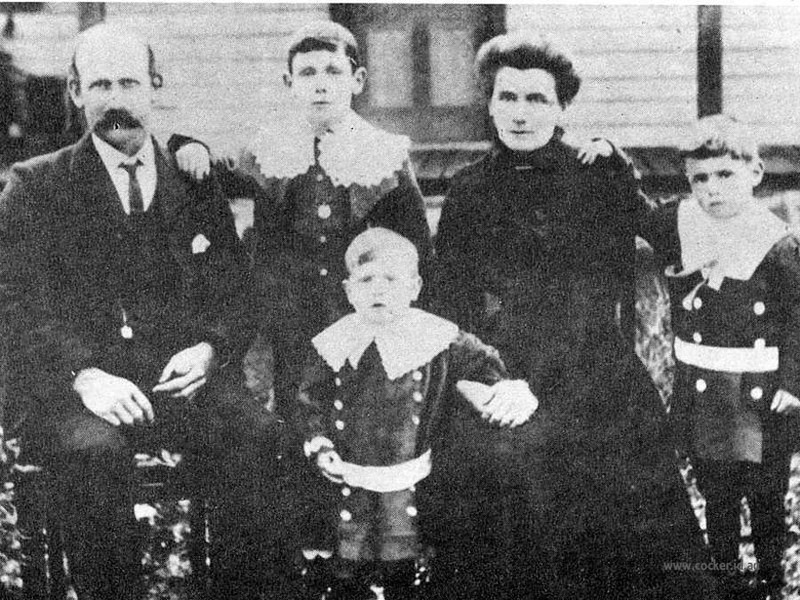 Arthur married his first cousin May Rebecca Walker, daughter of Thomas Walker and Rebecca Badcock, on 5 Feb 1901 in Westbury, Tasmania. May was born on 10 Apr 1877 in Spring Rises, Exton and died on 1 May 1947 in Launceston at age 70. Following is an account from Hector Walker, Arthur and May's eldest son's early memories. One of the first things that really sticks in my mind is when my grandfather, Samuel George Walker was building our house. I was three or four years old, there used to be terrible bushfires come through this area. We were living in a two roomed house with a shingle roof. This day I was inside the house and men were carrying water from the creek about a distance of 2 chain. There were men on the roof pouring the water over the timber shingles as the others were passing it up. I can still remember seeing the water pouring down the windows of the old house. What made conditions bad was that our house was built with thick scrub and timber surrounding it. All the land was the same around South Riana in those days, the block we had on the bottom side of the road was just virgin scrub and hadn't been cleared. The Fielding place had been scrubbed but there were no roads into the area then, while Samuel George Walker was building. There was a Bible study held among the Church members and one night Arthur was going to the Bible study-Prayer meeting and grandfather, Samuel George, wanted to go too but Arthur said, "No", he couldn't come because he was getting an old man, but he wasn't going to be put off, Arthur insisted that he was getting too old to walk across the log, which crossed the creek, at night, because he might slip off the log into the big hole in the creek where we got our water from. Arthur would not take him but after he had left, Samuel George went out and tried to walk across the log, he got to where the water hole was and sure enough he fell off, and he managed to get out of the hole himself and I remember him standing in the doorway with water dripping off him. Samuel Francis Walker worked on Thomas Walker's farm at Exton. Frank and Walter were in their late teens when they left Exton, the boys bringing the bullock dray with all their goods late in the year 1902-early 1903 and again went onto Thomas Walker's property of 300 acres. This was rough timbered country on the Loyetea Road where they worked, milking cows and they sent the milk down to the factory at Pine Road where they made cheese. Samuel Francis Walker was a good cricketer at Westbury and did most of the wicket keeping and it was said if he could not stop the ball with his hands, he would jump in front of it and let it hit his shins — in those days they didn't have any cricket pads. He worked the Riana farm for about 8 or 9 years, late 1909-early 1910 he started to have trouble with his leg and was in and out of hospital on several occasions for treatment and in 1910, Tuesday 28th July, he had to have his leg amputated because of gangrene, hence the reference in his letters to the fact that his leg had turned black. The Arthur mentioned in his letters was his brother who used to come and visit him in hospital. Occasionally he used to stay with his Aunt Alice when going in and out of hospital for treatment at Launceston. At the last he had spent months in bed without even being able to sit in a chair and at night the pain was unbearable. John Barker used to live opposite Samuel Francis Walker and also milked cows, grew oats and potatoes; their letters showed that they were very close friends, both of whom had a personal faith and trust in the Lord Jesus. About twelve months after Samuel Francis died, John was walking down a large log when he slipped off and shot himself in the leg and lost a lot of blood. Mr. Charlie Ling heard John's call for help and turned back to help him. He only lived a few days after this accident. Samuel's son Walter bought a farm at South Riana, consisting of about 50 to 70 acres. 4-William Thomas Walker was born on 1 Aug 1906 in Riana and died in 1991 at age 85. William served in the Second World War. William married Pearl Frances Mason, daughter of Andrew William Mason and Sarah Jane Ratcliff, on 20 Apr 1929 in Ulverstone, Tasmania. Pearl was born on 11 Feb 1909 in Barrington, Tasmania. They had three children: Joan, Molly May and Judith Gaye.